UPDATE: NFL Commissoner Roger Goodell reiterates his postion that everyone should stand for the national anthem.
.@NFL: Too much talk, not enough action. Stand for the National Anthem. The National Football League has been getting kicked in the teeth lately. It’s entirely their fault. The league and its players decided to go to war with Trump and suffered a humiliating defeat. The president didn’t start this conflict. Former San Francisco 49ers quarterback Colin Kaepernick did when he decided to sit and then take a knee during the national anthem last year. In September, Trump said that these players should be punished for taking a knee during the anthem. Everyone went nuts. The league thought the fans were on their side. The liberal pundits thought so as well. Everyone was confident that Trump picked a culture war that was unwinnable. Wrong. Seventy-two percent of Americans felt Kaepernick's antics were unpatriotic. The NFL, anti-Trump America, and the players fired a cruise missile. Trump and the rest of the country responded with an atomic bomb. As I’ve said ad nauseum, when people see you disrespecting the flag, or think that’s what you’re doing—the fight is over. It could be the greatest cause in the world—no on will care. That’s what happened here. Instead of shining light on police brutality and racial issues, players have to explain why they’re protesting. And so goes the axiom: when you’re explaining, you’re losing. The N.F.L. for now will continue to let players kneel or sit during the national anthem without a penalty, capitulating to demands by the athletes for free expression but potentially further alienating fans who object to the protests and feel they are disrespectful to the flag and the military. But, after a meeting Tuesday with union representatives and players, the league did promise to help support some of the causes targeted by the protesting players, including reform of the criminal justice system. The owners’ decision to not toughen the league’s stance on anthem demonstrations showed yet again the contortions they have been going through to display support for their players while wrestling with the political fallout of the sideline protests that have persisted since last season. 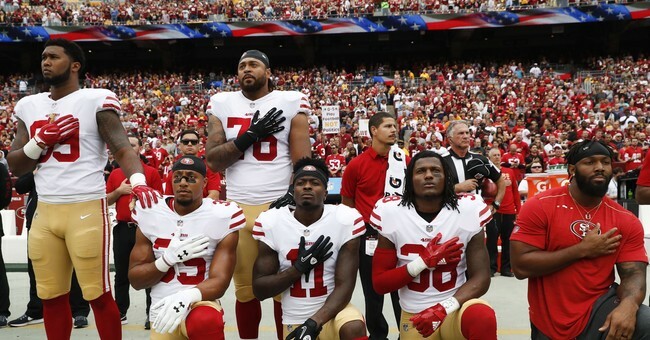 The players, largely on social media, had made clear they would not abide penalties for sitting or kneeling during the pregame anthem, while legal experts wondered if any punitive change would hold up in court. The gestures began last season, spurred by Colin Kaepernick, then the quarterback of the San Francisco 49ers, to draw attention to racial oppression and police brutality against black Americans. Declining NFL television ratings will lower CBS earnings, according to Credit Suisse. The firm cut its third-quarter EPS estimates by 5 percent, citing CBS' softer Sunday NFL ratings. The media company reports on Nov. 2. The analyst said CBS' Sunday NFL ratings are down 17 percent year over year during the first several weeks of the football season, according to the report. Sheikh released a similar report last week on Twenty-First Century Fox's earnings, which he also expects to disappoint thanks to weaker ratings by the NFL.